Rabobank says it will investigate the ouster of Michael Rasmussen from its Tour squad, but also committed to continuing its team sponsorship. And why would a team, with the biggest victory in cycling in its grasp, desert an innocent rider that they had vigorously defended through two weeks of questioning? 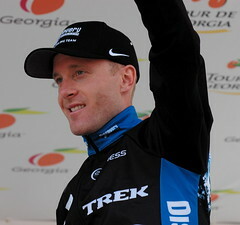 Rasmussen also said that if there were a chance for him to ride in next year's Tour, he would take it. Clearly, we'll have a drug-free Tour de France, as every rider cleared their pre-race medical and dope checks. Barring a last-minute catastrophe, like Matthew White's 2004 crash while warming up for the Prologue, all 189 riders named by their teams should take to the line tomorrow in London. CSC director and team owner Bjarne Riis won't be chasing his riders all over France for the next three weeks. It's Riis' honest admissions that got him here: He admitted back in May that he used EPO through much of his career, including when he won the 1996 Tour de France. In his interview with Der Spiegel, Jörg Jaksche, who rode with Riis at Telekom and for Riis at CSC for a season, said he doped with Riis' knowledge while racing for CSC. Team Milram director Gianluigi Stanga, who was Jaksche's director at Polti in 1997, will also skip the Tour. The Tour organization continues its cautious experiments in new media. The new Tour website (French, English, German, Spanish) adds a smattering of Flash for navigation, but otherwise, it's what we've all come to expect. Over at YouTube, however, there's an official new Tour de France channel. There are 11 videos so far, mostly in French, but with a smattering of other languages. The Tour isn't giving up all control, however, as comments and embedded video both are disabled. T-Mobile captain Michael Rogers could miss the Tour, as a micro-fracture in his right knee continues to plague him. Rogers missed the last three stages at the Tour de Suisse, but says he's still 90 percent to start in London next Saturday. “For this to happen now it's a kick in the teeth for everyone. We're just going to deal with it the best we can,” Rogers said. 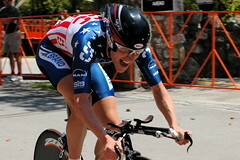 Rogers, a 3-time world time trial champion, finished 10th at last year's Tour. After extensive Tour preparation, Rogers has cut back on his mileage, and said he'll likely need to ride back into top condition if he's able to start the Tour. I want to take a moment here to once again, for the millionth time, express my gratitude to the Versus TV network for providing live coverage of most of the world's greatest bike race. Canada: OLN lives on north of the border, entering their 7th year of coverage. Here's their full schedule. They'll also broadcast a show called “Lance's France: The Travellers Guide,” first airing this Sunday, July 1st at 8 pm ET/PT. UK: Reader MJ Ray notes that itv, the official British broadcast partner, has yet to publish a Tour schedule, but he's got a rundown on his weblog based on what he could get from the tvtv listings service. Australia: SBS broadcasts the Tour for the 17th consecutive year. They've got live coverage of every stage, a pre-Tour special called “Aussie Onslaught: 25 Years of le Tour” on July 5th, and Belleville Rendezvous immediately after. But what if you're trapped at work during the live coverage? I took advantage of a recent super deal at Woot.com to grab a refurbished Slingbox — my boss has been raving about his for months. The Slingbox is a smallish box that hooks to your video source -- the coaxial cable that brings TV into your house, or the box that decodes a signal and sends it to your TV, and also hooks up to the internet. Through some awesome magic, when you leave your house, software on your PC, Mac, Windows Mobile device, Symbian phone, or certain models of Treo can find your box, and stream the video and audio over the internet. The setup works well, even on my pokey 1.2-megabit first-generation ADSL connection, and the picture quality improves with your home connection speed. There's a model with HD support as well as the normal NTSC model at right. Team Milram's Alessandro Petacchi, one of the sport's outstanding sprinters, faces a hearing to explain his high reading for salbutamol during the Giro d'Italia last month. The UCI notified Italian officials yesterday that Petacchi is officially “non-negative” after registering a salbutamol level of 1,320 nanograms/millileter after his Stage 11 Giro win in Pinerolo. Salbutamol is a common asthma medication that can have stimulant and anabolic effects at high doses. Many endurance athletes, including Petacchi, have therapeutic use exemptions allowing them to use inhaled salbutamol to address exercise-induced asthma. The World Anti-Doping Agency tries to control salbutamol levels by setting a limit of 1000 nanograms/milliliter in rider urine samples. A higher level is an “adverse analytical finding,” which shifts the burden of proof onto the athlete, who must prove the finding resulted from use of a salbutamol inhaler. “Why would I have done something different from other times? I have the responsibility of the team on my shoulders, with the sponsors that are always speaking against doping. At least one study suggests it is possible to reach levels above 1000 ng/mL through inhalation alone. Another suggests it may be possible to measure inhaled versus orally administered salbutamol. 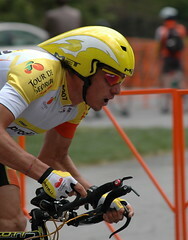 Petacchi has won 4 Tour stages in his career, all in 2003. He was dominant in this year's Giro, winning 5 stages. He has been left off the start list for this weekend's Italian national championship. Unibet.com is filing suit against ASO, the organization that runs the Tour de France, over their exclusion from the race. Unibet.com is a ProTour team, but seemingly in name only. They've been denied entry into all three Grand Tours, initially because of complaints by organizers that the ProTour had expanded too far, preventing GT organizers from inviting wild card teams. ASO has a stronger basis for preventing Unibet.com from racing, because their title sponsor is an online bookmaker. French law that prohibits the advertisement of foreign gambling concerns in French events. Defending white jersey winner Damiano Cunego of Lampre-Fondital won't participate in this year's Tour de France. Cunego, 25, won the Giro d'Italia in 2004, finished 5th this year, and was best young rider at the Tour last year. 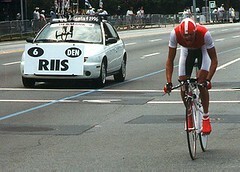 Versus continues its tradition of heavy Tour de France coverage, with an average of 17 hours per day of Tour coverage. As in previous years, they'll join the race at 8:30 a.m. Eastern most days, with coverage as early as 6:30 a.m. Eastern for key mountain stages. Looks like the same broadcast team, too: Phil Liggett and Paul Sherwen doing live coverage; Bob Roll and Al ("Average American Sports Fan") Trautwig hosting the prime-time reruns; and Craig Hummer, Frankie Andreu, and Robbie Ventura providing color and features reporting. It looks like Sunday coverage is improved -- I seem to remember that CBS had rights to Sunday stages, trumping Versus live coverage, and limiting them to evening reruns. This year, Versus will run the live coverage on Sunday mornings, skip the Sunday afternoon show that might conflict with CBS Sports, then rerun the footage during the prime-time show at 8 Eastern. Here's the full US schedule. T-Mobile has withdrawn its sponsorship of the Tour de France TV coverage in Germany. The company is apparently trying to distance itself from admissions by former riders for its team (then called Telekom) that team members, including 1996 Tour winner Bjarne Riis, used EPO and other banned performance enhancers while racing for the squad. T-Mobile has pledged to sponsor its team through 2010, the end of its current contract. In case anyone misses the symbolism, the company has asked that the money be used to strengthen the German anti-doping agency instead. South Africa's Robbie Hunter will lead Barloworld in this year's Tour de France. The former Phonak sprinter will be joined by Italy's Fabrizio Guidi, Colombia's Felix Cardenas and Mauricio Soler, Alexander Efimkin of Russia, and 21-year-old Welshman Geraint Thomas. Thomas was a track star, part of the four-man team that won gold in the 4k pursuit at this year's track world championships. He would become the first Welsh rider in the Tour since Colin Lewis in 1968. The team's final three will be chosen from 8 candidates a few days before the Tour begins. Tour organizers announced this year's wildcard teams today, naming Agritubel, Astana, and Barloworld as the final three squads in the 2007 Tour. They join almost all of the ProTour squads, minus Unibet.com, to make a field of 189. Française des Jeux's Bradley McGee will miss this year's Tour, as he did last year, because of ongoing back problems. 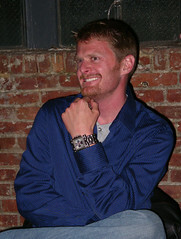 McGee says an unsuccessful surgery would end his career, but that a successful procedure should have him back on his bike for late-season races in 2007. 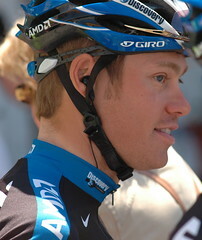 McGee's condition dates back at least to 2004, when he fought through pain before abandoning during Stage 5. 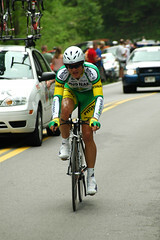 In 2003, McGee won the prologue of the Centenary Tour, and wore the yellow and green jerseys as a result. If you're planning on checking out the Tour this year as it visits London and southeastern England, you can start planning the best locations for viewing. The course details for the prologue, around central London, and Stage 1 out to Canterbury, were published today. The concluding stage of this fall's Tour of Britain will include a 50-mile stage across London, including 20 laps of St James's Park in front of Buckingham Palace. Beginning at Greenwich Park, the stage will follow part of the route for next year's Tour de France, and cross Tower Bridge. It will also echo the proposed route of the road race for the 2012 Olympics over Hampstead Heath then through Regent's Park and Hyde Park on its way down to the final circuits. The stage is scheduled for September 3rd as the sixth stage of the UCI 2.3-rated Tour of Britain. Bike For All reports 1200 people have already signed up to help with the Tour de France when it visits London and southeastern England in 2007. Organizers plan on using 2000 volunteers to man road crossings, manage crowds, and help out with spectator questions. Here's the link at tourdefrancelondon.com, which is counting down the seconds (!) until the 2007 Grand Depart. Details of the 2007 Tour de France “Grand Depart” from London were released today. The Tour's opening ceremonies will be in Trafalgar Square July 6, 2007. The 8-kilometer prologue will start there, and take in Downing Street, Parliament Square, Westminster Abbey, Buckingham Palace, and Hyde Park, finishing on The Mall near the palace. Stage 1, a 200-km day for the sprinters, on July 7, will begin on The Mall, passes the London Eye, St. Paul's Cathedral, and the Tower of London, out through Greenwich and finishes at Canterbury. Discussions are underway on how best to memorialize the 2nd anniversary of the London transit bombings, which were July 7, 2005. "Having the Grand Depart on July 7 will broadcast to the world that terrorism does not win, it does not change a city, it does not shake our faith," Livingstone said. "There will be no better way of celebrating the unity of humanity than this great sporting event in this city on that day." London mayor Ken Livingstone announced today that the 2007 Tour will, as expected, start in London. It will mark the 3rd time the Tour has visited England, and the first ever visit to the capital. "I want London to become a world-class cycling city and Transport for London has increased investment in cycling from £5.5 million in 2000 to £24 million this year." The route is to be announced February 9. Press conferences have been scheduled for January 24th in Paris and February 10th in London to make announcements on the British capital's Tour bid. Officials won't confirm that London has the nod, but there's no reason to hold a press conference in London to announce a Tour start in Rotterdam, Utrecht, or Lugano, the other candidates. The Tour has visited England twice, most recently in 1994, but has never included London. The proposal, initially hatched in 2003 for the 2006 Tour, was for a 2007 Tour start, with a prologue around London landmarks, a Stage 1 from Greenwich to central London, and Stage 2 out to the coast, before a transfer across the Channel. Any bad blood over the 2012 Olympics, awarded to London over Paris, has apparently been set aside. April 27, 2004 | London start in 2007?